The remarkable cellist, composer and improviser Frances-Marie Uitti performs works by Salvatore Sciarrino, Jonathan Harvey, Huang Ruo, Lisa Bielawa, Annie Gosfield, György Kurtág, and her own Rap’t. 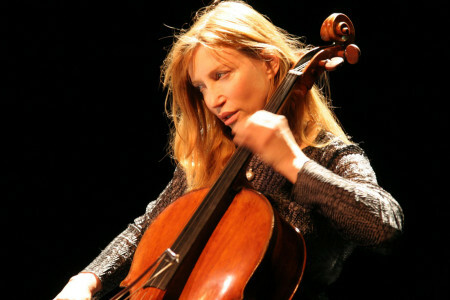 Frances-Marie Uitti has pioneered a revolutionary dimension to the cello by transforming it for the first time into a polyphonic instrument capable of sustained chordal (two, three, and four-part) and intricate multi-voiced writing. Using two bows in one hand, this invention permits contemporaneous cross accents, multiple timbres, contrasting 4-voiced dynamics, simultaneous legato/articulated playing, that her previous work with a curved bow couldn’t attain. György Kurtág, Luigi Nono, Giacinto Scelsi, Louis Andriessen, Jonathan Harvey, and Richard Barrett are among those who have used this technique in their compositions dedicated to her. She has also worked closely with John Cage, Iannis Xenakis, Elliott Carter, Brian Ferneyhough and countless composers from the new generation. As an improviser, she plays in duos and trios with Mark Dresser, Evan Parker, Joel Ryan, Elliott Sharp, Paul Griffiths, Wilbert de Joode, Mischa Mengelberg and others, and also collaborates with various filmmakers, DJs, and video artists. Based in Amdsterdam, Ms. Uitti performs regularly in festivals around the world, and has recorded for labels such as ECM, Wergo, CRI, BVHaast, Mode, and HatHut, and Cryptogramophone. She has written for the Cambridge Companion to the Cello, Contemporary Music Review, Musik Texte, and Tempo magazine, and given lectures and master classes at practically all of the major European conservatories and universities in the USA.